Human migration occurs for a variety of reasons, and the same applies to why such people access psychological services. Often migrants are offered therapies in their second language, either directly or indirectly with the help of an interpreter. 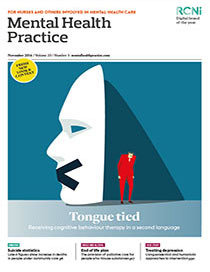 While there is a body of evidence surrounding the use of first and second languages in the linguistic field, little attention has been given to the use of first and second languages in cognitive behavioural therapy (CBT). The case studies presented here explore the experiences of recipients of CBT whose first language was not English. Emotionally charged moments were explored in either their first language or English. The participants were interviewed using a semi-structured interview questionnaire and the Autobiographical Memory Questionnaire. The results were analysed using the Framework Analysis technique as described by Ritchie and Spencer (1994). Nine key themes emerged from the data. Exploration of charged moments in the migrant’s first language while they are having therapy in their second language can be an effective way to aid collaboration, develop a shared understanding, identify underlying beliefs and reduce the effects of the second language as an avoidance mechanism. Therapists and clinicians can be creative when working with this group to make interventions more effective.